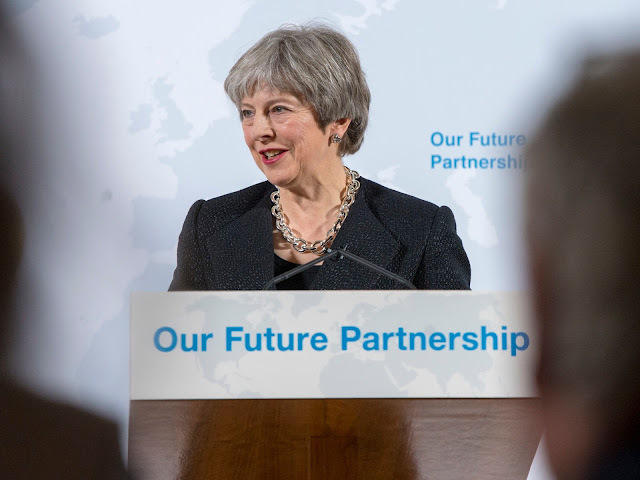 Theresa May travelled to all four nations of the United Kingdom this week, marking a year till Brexit. 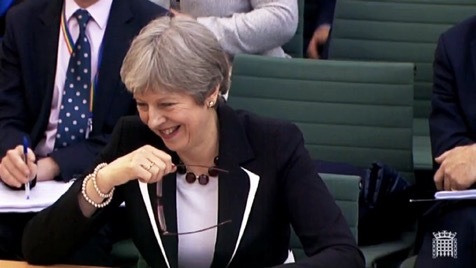 But on Monday, she was in the House of Commons delivering an update on the European Summit meeting. 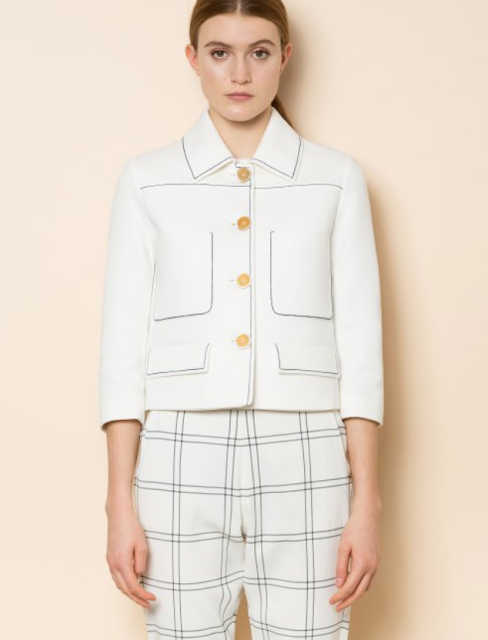 The PM wore her light blue blazer, teaming it with a navy skirt and the leopard Charlotte Olympia Kitty heels. 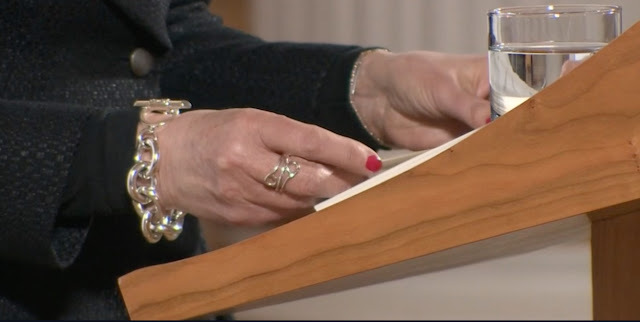 She accessorised with a simple string of pearls. 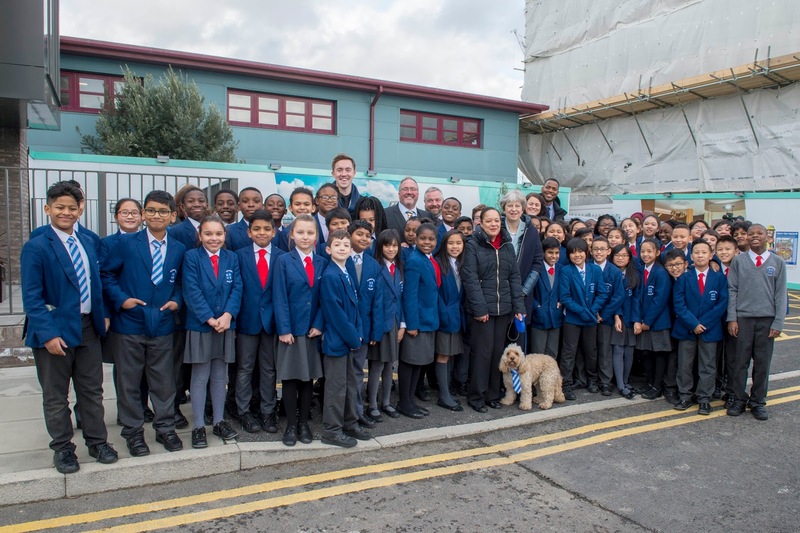 On Tuesday, May appeared before the House of Commons Liaison Committee, answering questions from Committee chairs. 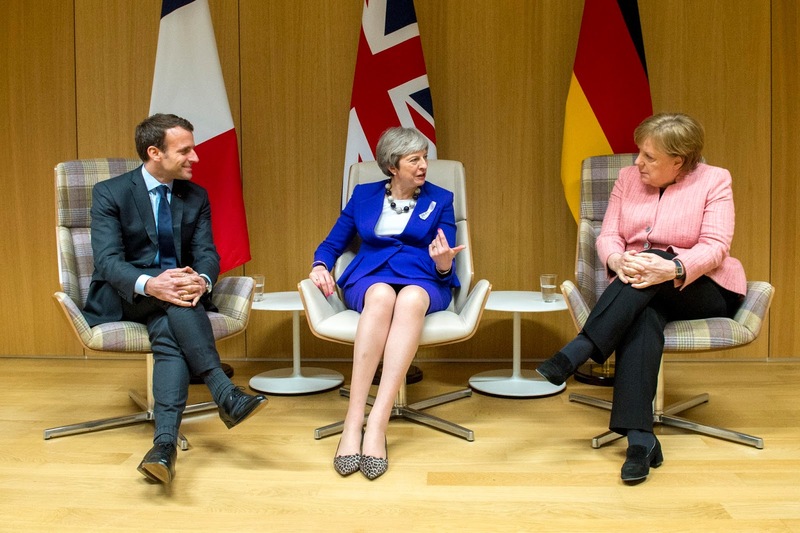 May wore her black and white Escada blazer, teaming it with a black skirt and the red Link In block heels from Russell & Bromley. She accessorised with a deep red jewelled necklace. 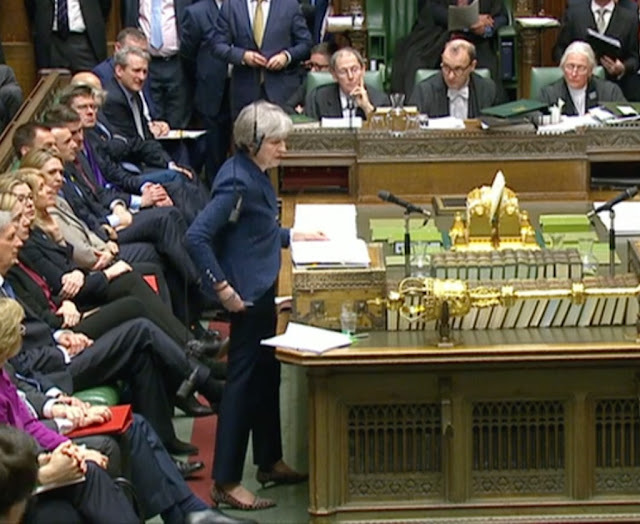 On Wednesday, May was in the Commons chamber again for the weekly Prime Minister's Questions. 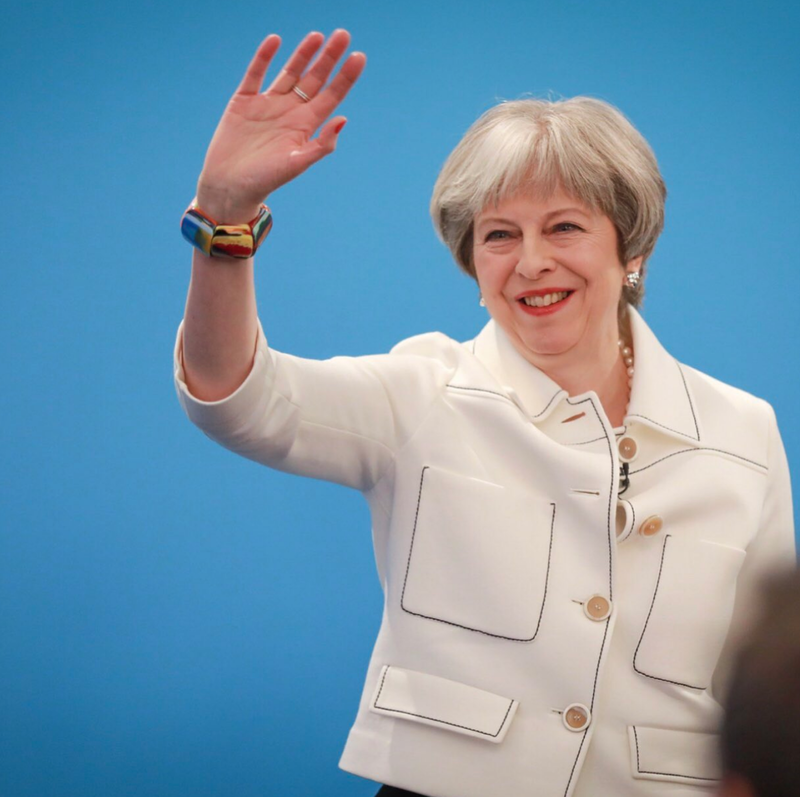 She debuted a new navy stripe jacket from Daniel Blake, and a navy skirt. 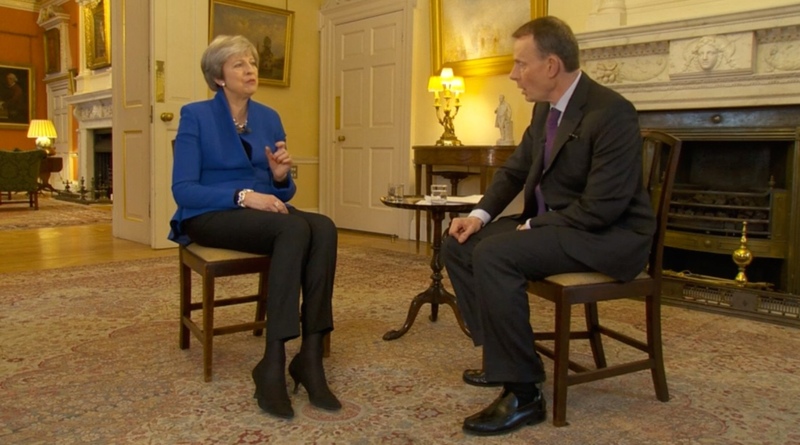 May selected the navy Twiggy kitten heels from Russell & Bromley and accessorised with a string of pearls. And on Friday, May helped to marshall the Maidenhead Easter 10- wet weather gear was required! 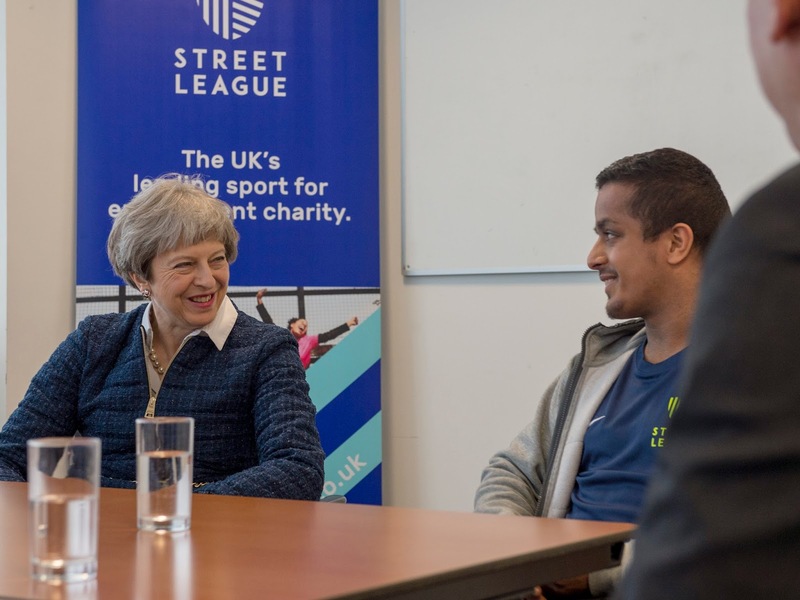 Theresa May kicked off her week with a visit to Street League, a youth charity in Birmingham. 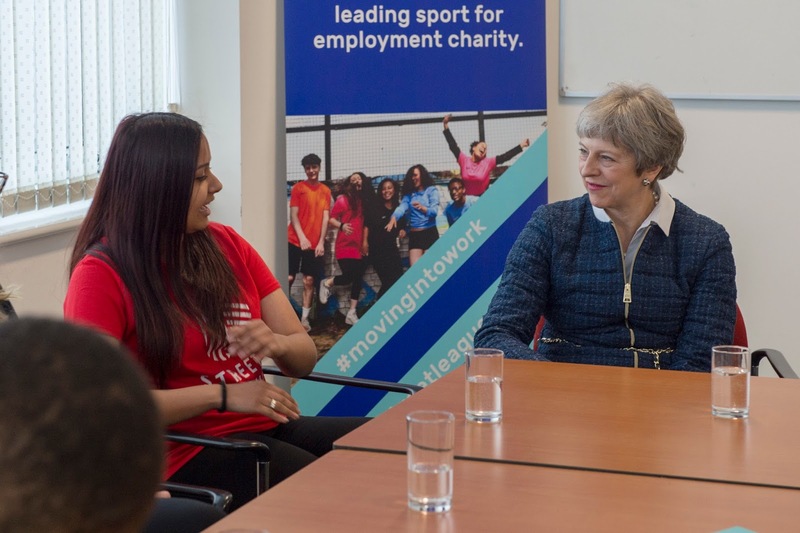 The PM announced the launch of an innovative new programme to address ethnic disparities in youth unemployment and to help disadvantaged young people get into work. It was a double Herno coat day for the PM- wearing the navy tweed padded jacket with chain detail and her navy Herno overcoat. May teamed it with black trousers and the leopard Delicious flats from Russell & Bromley. 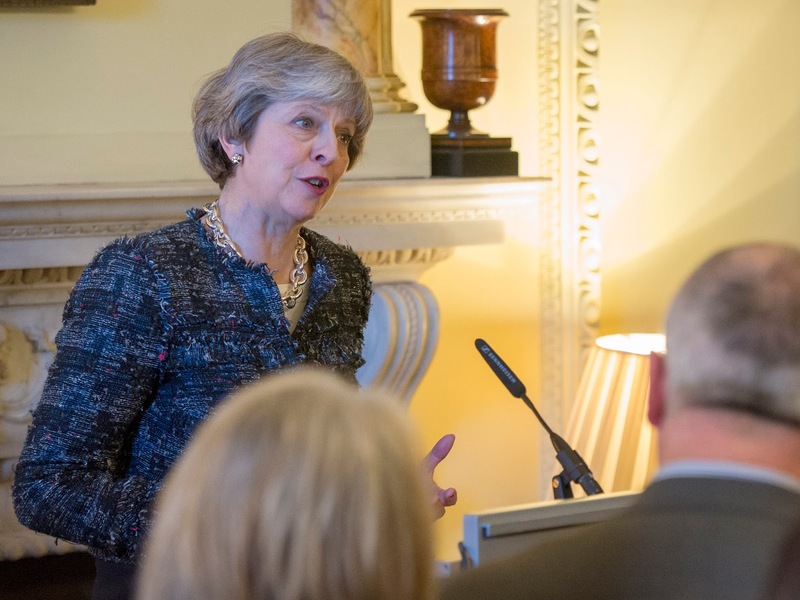 On Wednesday, the PM took part in the weekly Prime Minister's Questions. May wore a black trouser suit and ivory top, accessorising with the Amanda Wakeley chain bracelet and necklace and the Divine flats from Russell & Bromley. Later in the day, Theresa May welcomed Andria Zafirakou, winner of the prestigious Global Teacher Prize to the House of Commons. 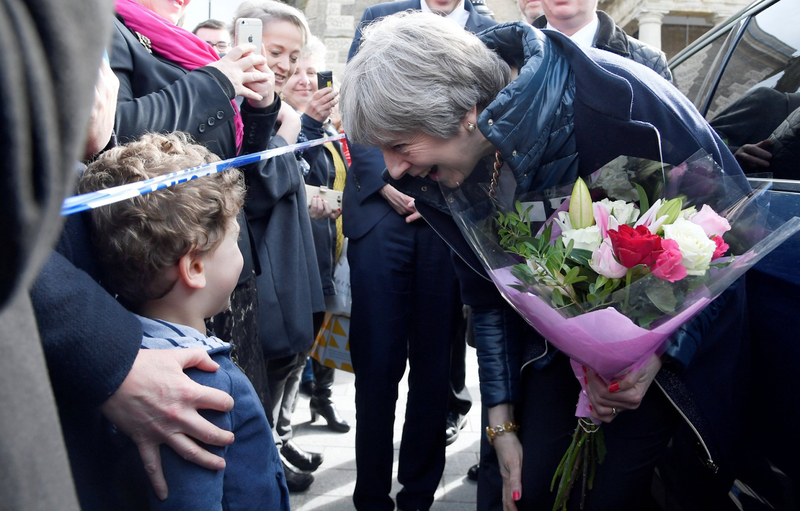 On Thursday, May laid a wreath in Parliament Square to mark the one year anniversary of the Westminster attack. Later that day, she attended the European Leaders summit in Brussels. 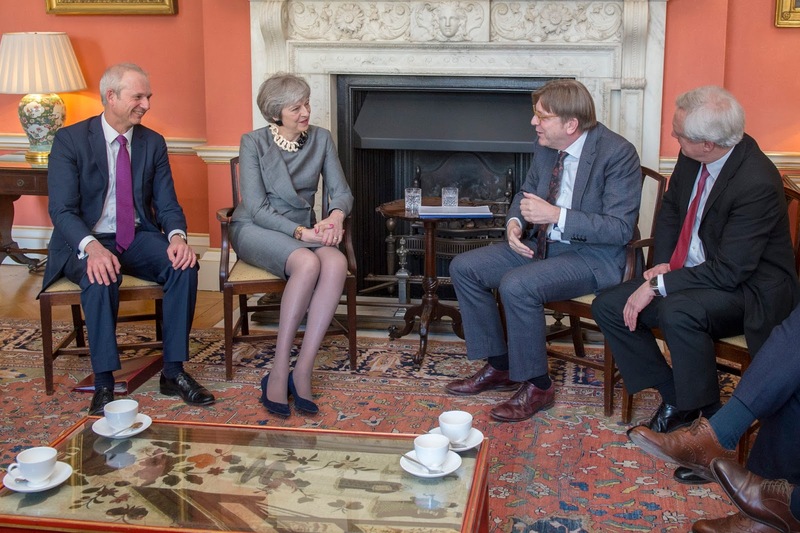 May wore her purple Origami Daniel Blake skirt suit, teaming it with the leopard Charlotte Olympia kitten heels, a black and white oversized bead necklace and her Herno coat. 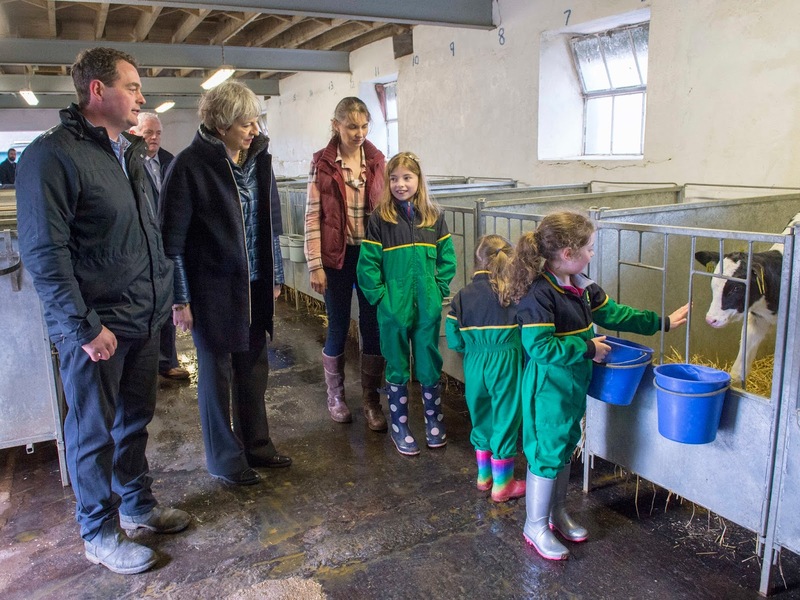 We've been eagerly awaiting some new pieces to crop up in Theresa May's wardrobe and they haven't disappointed! There are some great new season pieces at Amanda Wakeley and it seems like the PM has heard about them too! 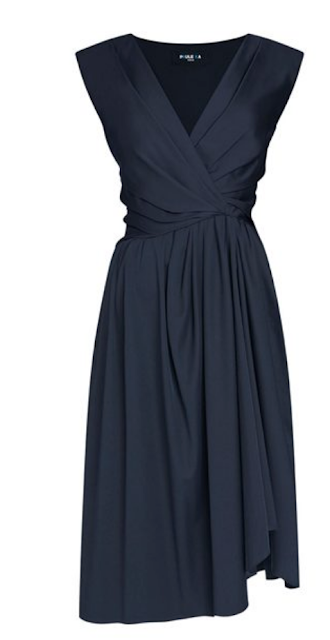 May debuted a fab black evening dress at the Westminster Correspondents' Dinner earlier this month. 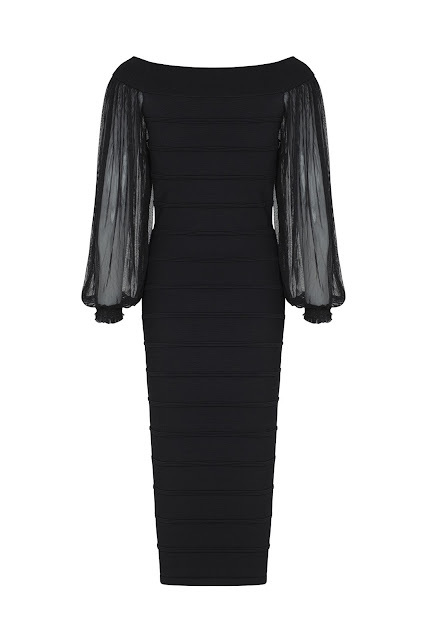 The black sculpted viscose dress by Amanda Wakeley is a bandage style with an off the shoulder neckline and sheer, playful sleeves. 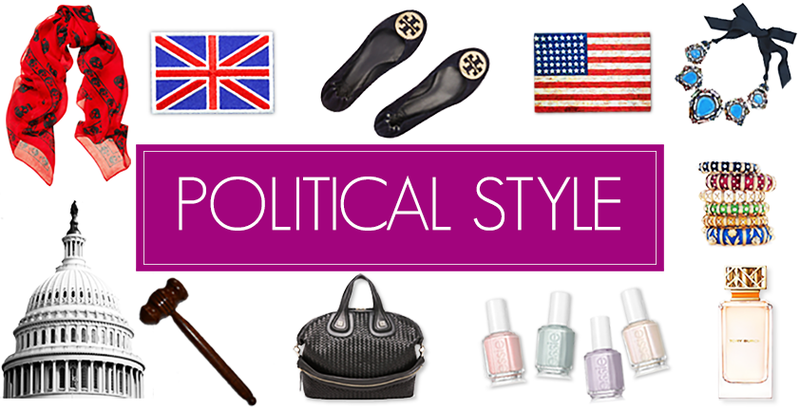 Super glam! 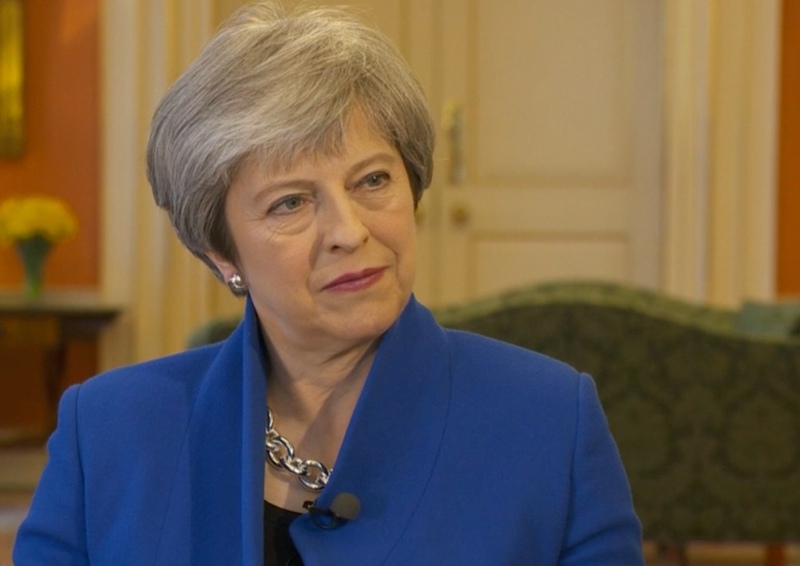 We know the silver chunky chain necklace is a style staple in the PM's wardrobe, and May has updated her look this season with a rose gold ribbon version. 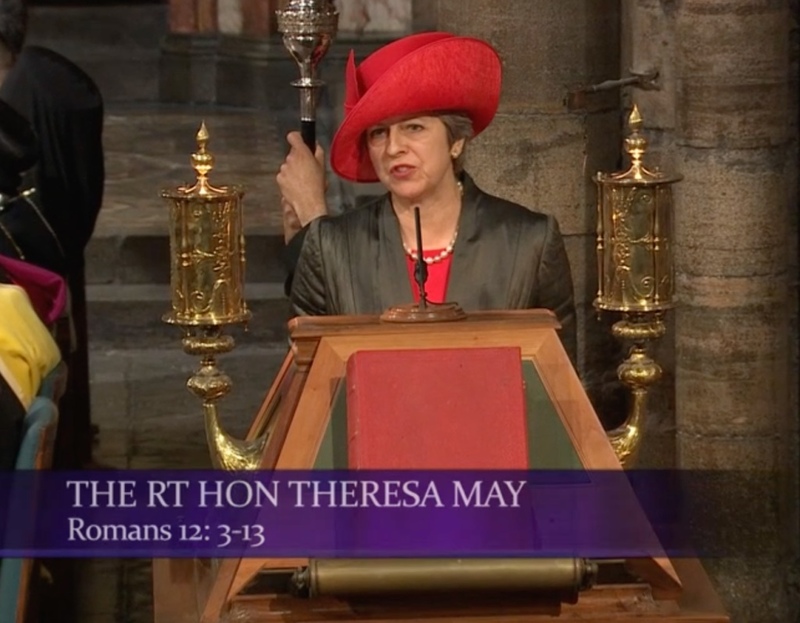 She wore it on her visit to Salisbury, and expect to see it making a few more regular appearances! 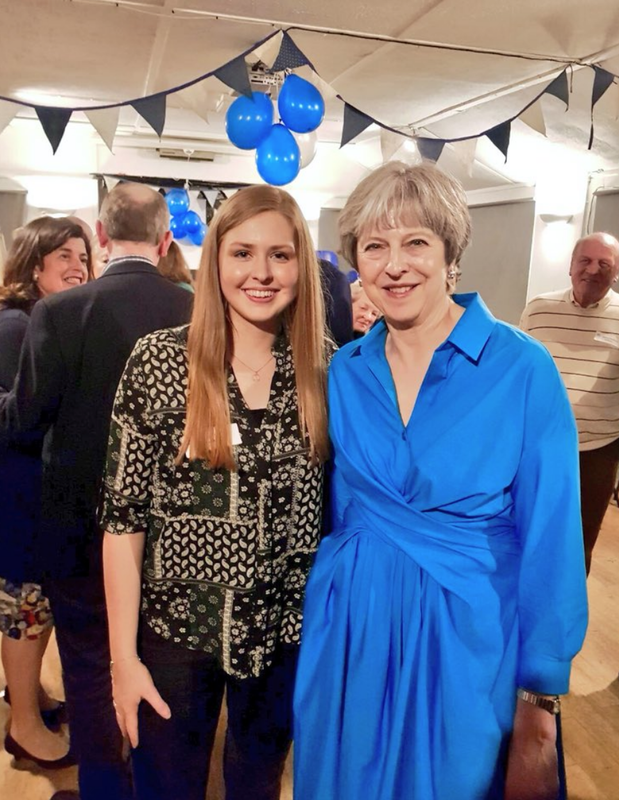 It's always great to see the PM off duty and at a Maidenhead party drinks event, May wore a fantastic blue shirt dress which we've not seen before! We're on the trail for an ID, but it is likely to be from Paule Ka. A similar navy sleeveless dress is available from the PM's favourite boutique, Fluidity. And we were treated to another new piece at Spring Forum! For her closing speech, the PM wore a bright white scuba jacket with blue stitch detailing from Piazza Sempione. The perfect choice against the sky blue stage background! 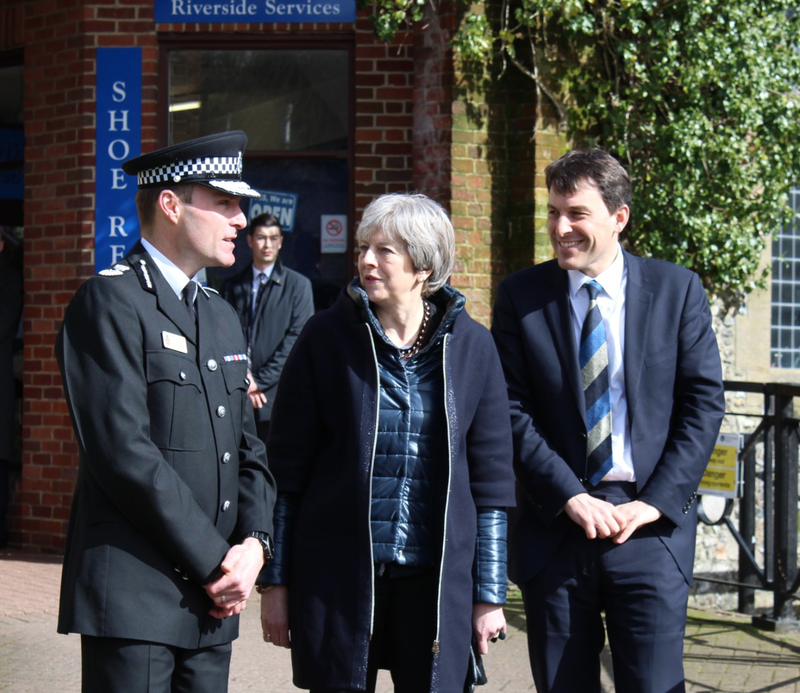 From visiting Salisbury to ending the week in her constituency, it's been an action packed one for Theresa May. 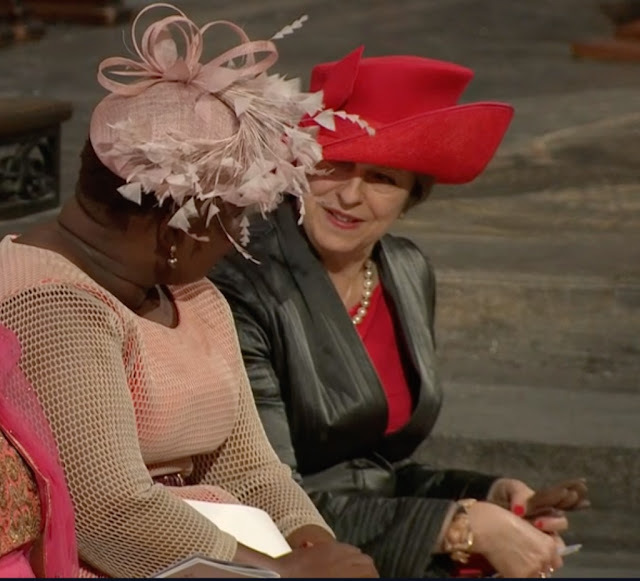 On Monday, the PM attended the annual Commonwealth Day service at Westminster Abbey. May looked to some old favourites for her outfit- wearing a red jersey dress with a metallic quilted long coat. She accessorised with a hat from Henley on Thames milliner Liz Felix, a cherry red clutch bag from Mulberry and the Minu patent kitten heels from LK Bennett. 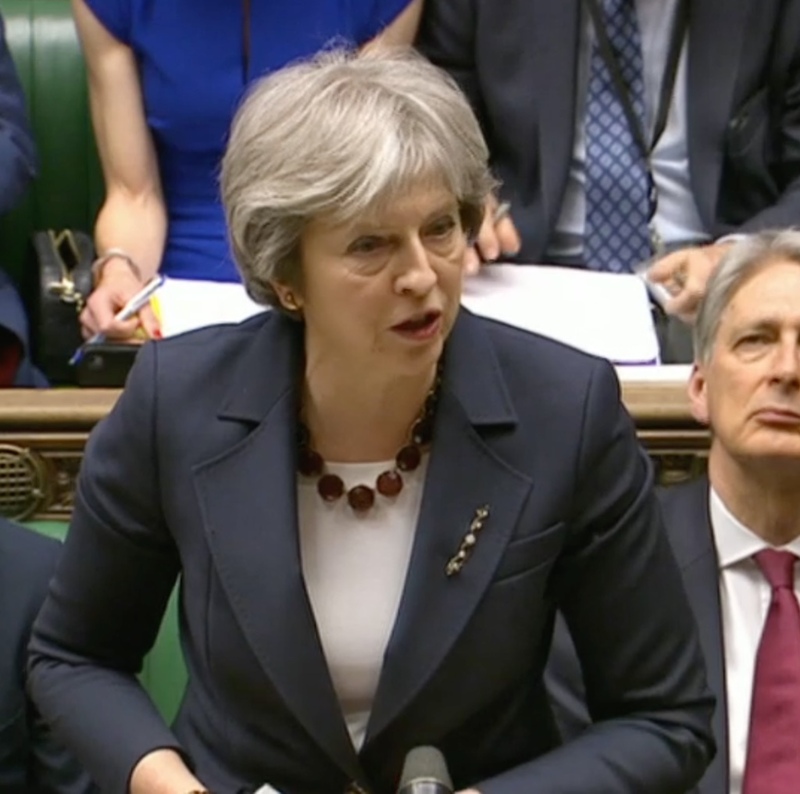 In the afternoon, Theresa May addressed the House on the developments in Salisbury. 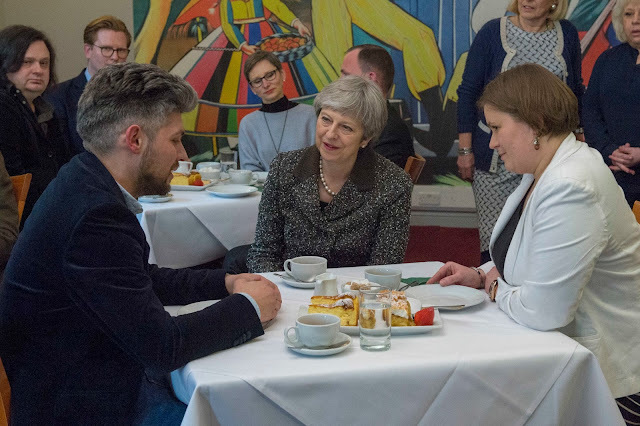 May wore black trousers and her caramel floral tweed jacket from Paule Ka. On Tuesday, May was in the chamber for the Spring Statement. We saw a return of her black and white Escada blazer, this time teamed with a black skirt, the leopard LK Bennett kitten heels and a silk scarf from Hermes. 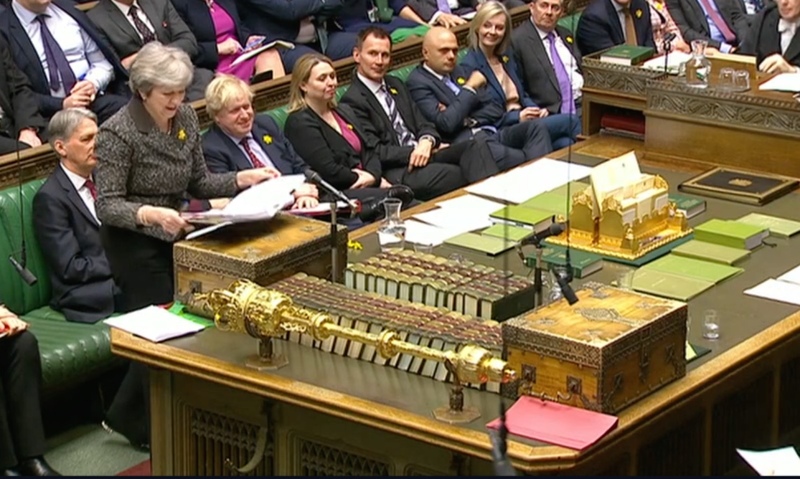 On Wednesday, the PM took part in PMQs. 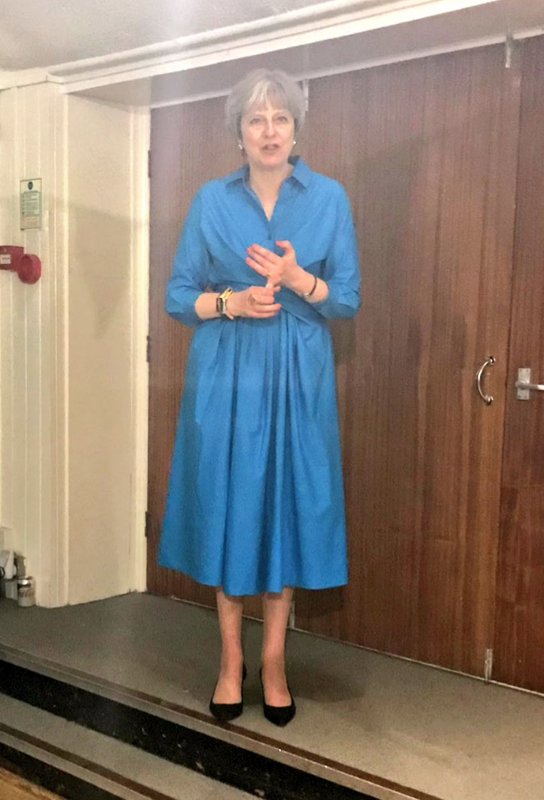 Her navy Escada skirt suit made another reappearance, this time teamed with a deep red oversized necklace and the leopard Charlotte Olympia kitten heels. May also welcomed Luxembourg's Prime Minister Xavier Bettel to Number 10. 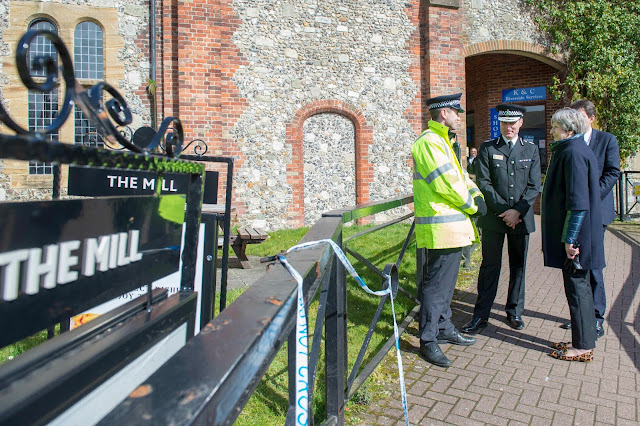 On Thursday, May travelled to Salisbury to meet with emergency services, local residents and first responders. 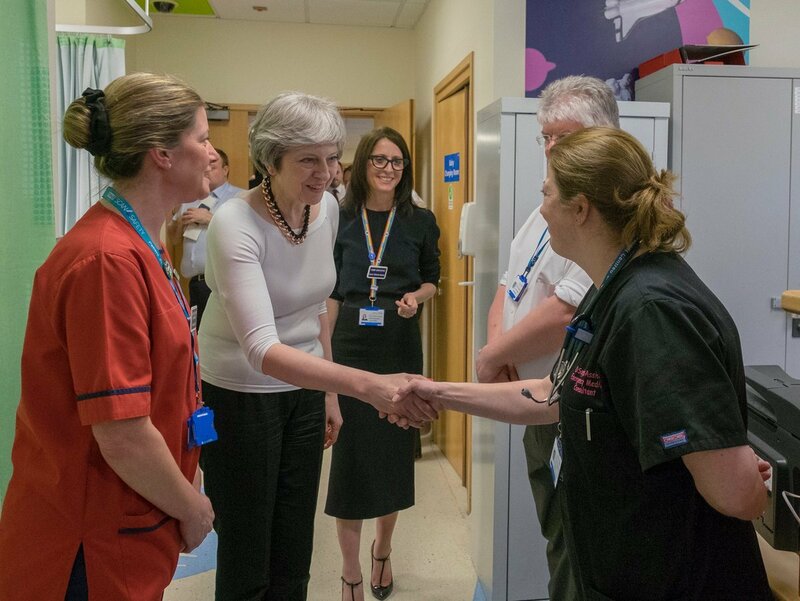 We saw a Prime Ministerial fist bump! The PM wore black trousers, a tailored jacket from Daniel Blake and the leopard Cocktail loafers from Russell & Bromley. The fab Herno coat made another outing and TM debuted her new rose gold chunky chain ribbon necklace from Amanda Wakeley. On Friday, Theresa May was in her Maidenhead constituency. 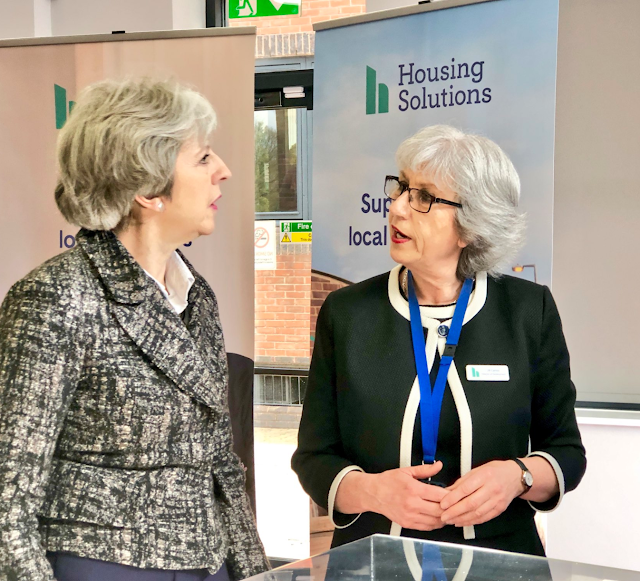 May visited Housing Solutions and met with residents. Cue these great photos! 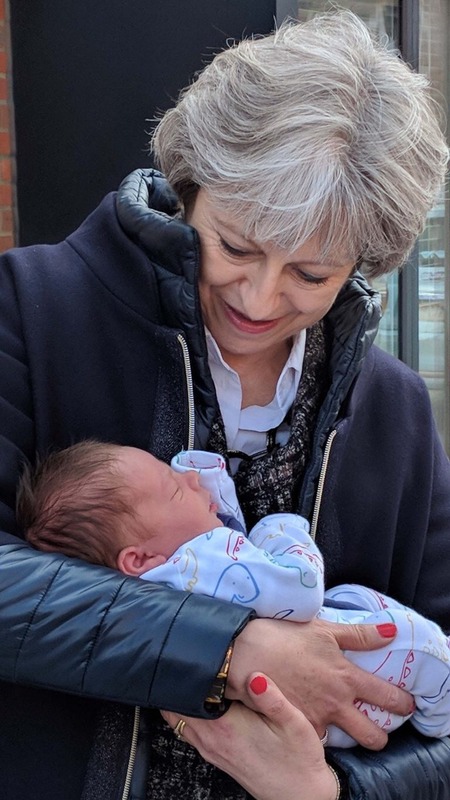 May wore a black and white textured jacket and a black skirt, keeping warm against the cold weather thanks to Herno coat. In the evening, May attended a drinks reception in Maidenhead debuting this fabulous bright blue shirt wrap dress, teaming it with the Twiggy kitten heels from Russell & Bromley. Thanks to Kirsty for the pics! Theresa May started the week with an interview on the Andrew Marr Show discussing her Road to Brexit speech. Filmed in the White Drawing Room, the PM wore the bright blue Orchid jacket by Daniel Blake, black trousers, the Amanda Wakeley oversized chain necklace and bracelet and the Twiggy kitten heels from Russell & Bromley. 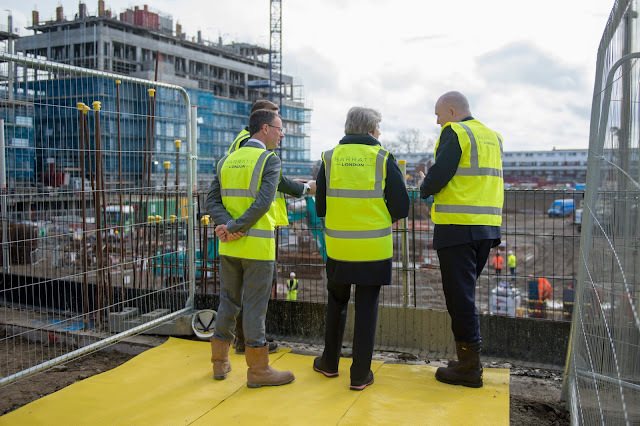 On Monday, the Prime Minister delivered a speech in London on home ownership before visiting the Upton Gardens construction site, meeting apprentices and local children. 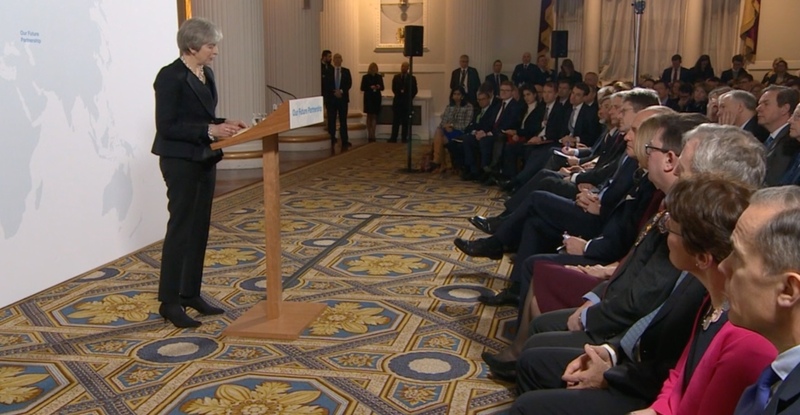 The PM wore a true blue outfit- picking her cool blue blazer, navy trousers and the Cocktail flats from Russell & Bromley. 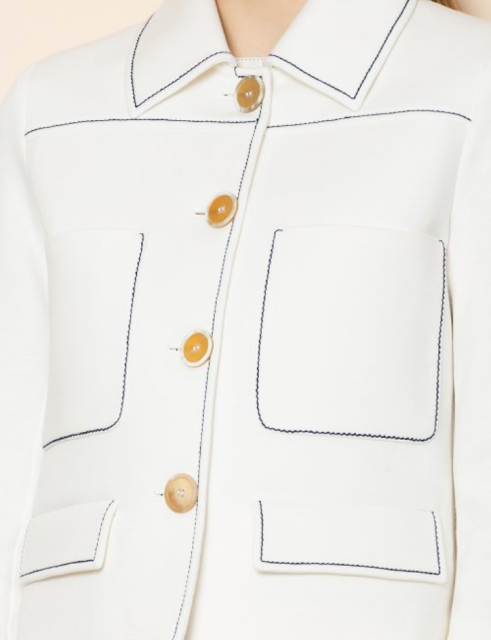 Our favourite Herno coat made a reappearance! On Tuesday, May met Guy Verhofstadt MEP at Downing Street, as part of ongoing engagement with representatives from the European Parliament. 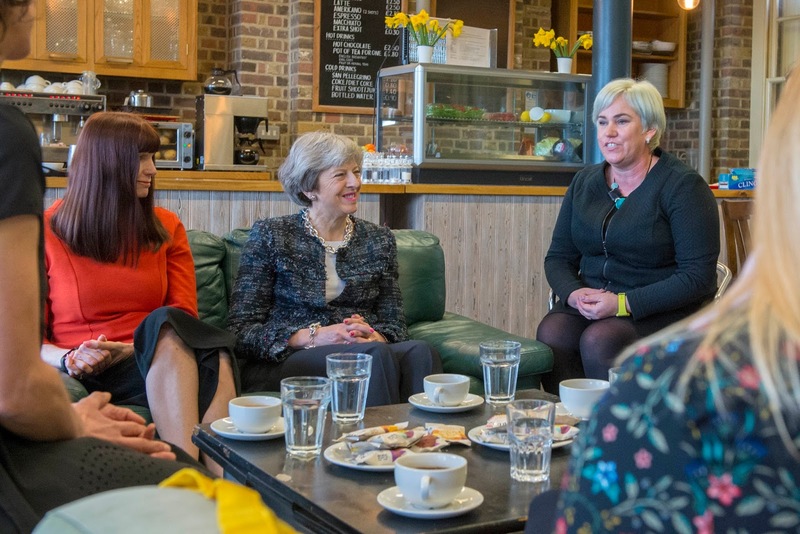 The PM wore a grey custom dress by Daniel Blake, the navy Twiggy heels from Russell & Bromley and oversized bakelite jewellery. 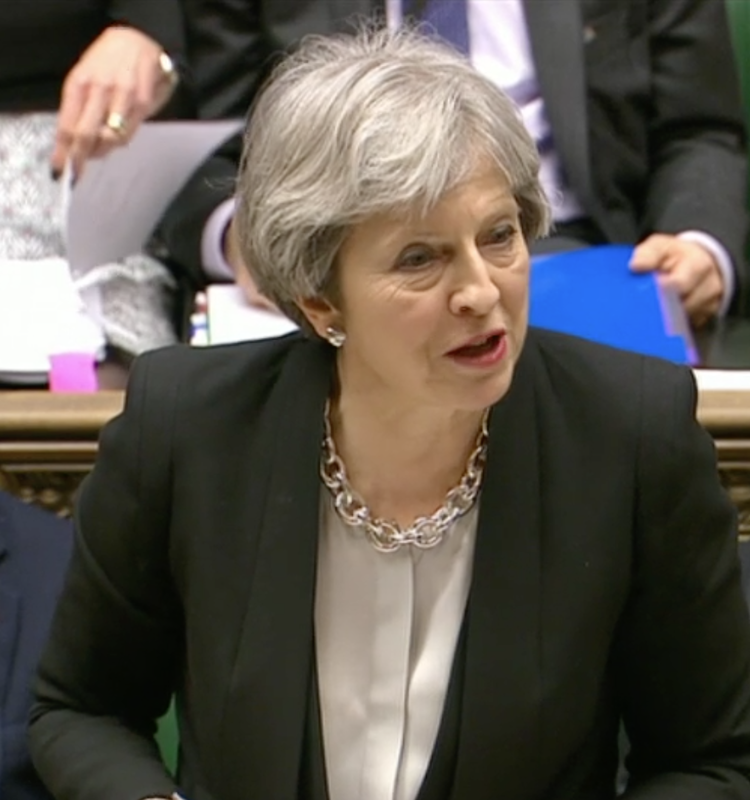 On Wednesday, the PM took part in the weekly Prime Minister's Questions. It was the third day running for a Daniel Blake piece, this time the navy spotted Military jacket and navy trousers. 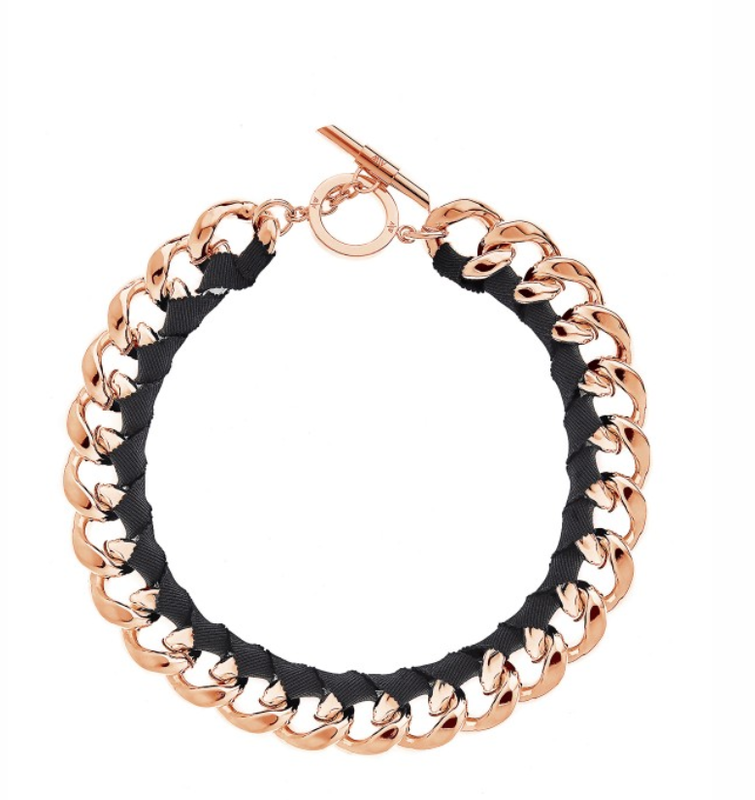 May teamed it with the leopard Charlotte Olympia Kitty heels. 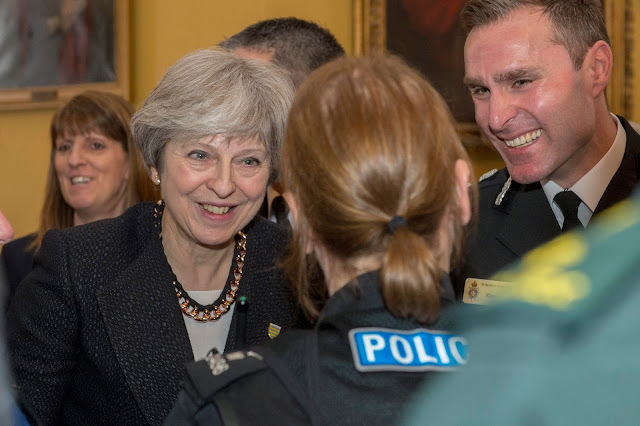 Later in the day she welcomed Saudi Arabia Crown Prince Mohammed Bin Salman to Number 10. 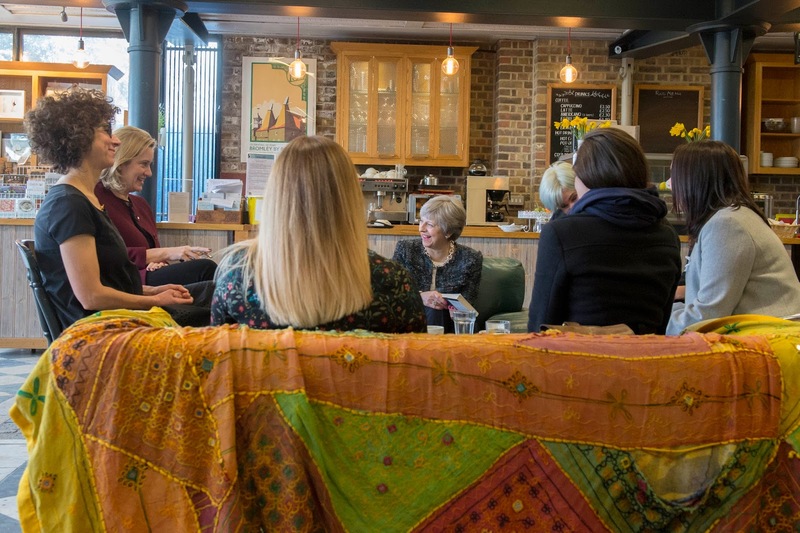 On Thursday, the PM and Home Secretary Amber Rudd visited a centre for victims of domestic abuse. During the visit the Prime Minister and the Home Secretary shared a cup of tea with survivors of domestic abuse and talked about their experiences. They also joined an Independent Domestic Violence Advisors (IDVA) training course. Later in the day, the PM hosted the International Women's Day reception at Downing Street. 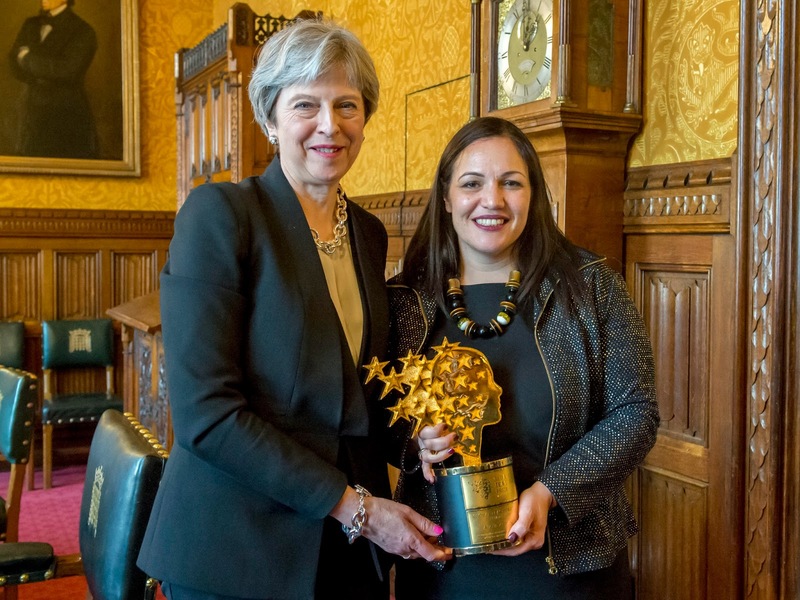 May wore the sparkly tweed DvF jacket, teaming it with black trousers, the oversized Amanda Wakeley chain set and the Divine flats from Russell & Bromley. 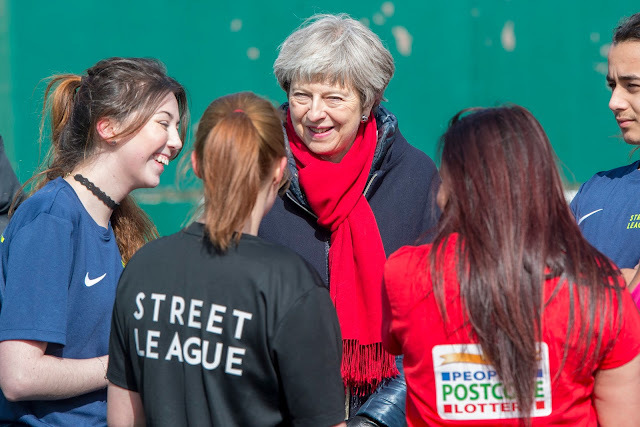 Whilst the weather stopped play for most of us, it didn't stop proceedings for the Prime Minister! 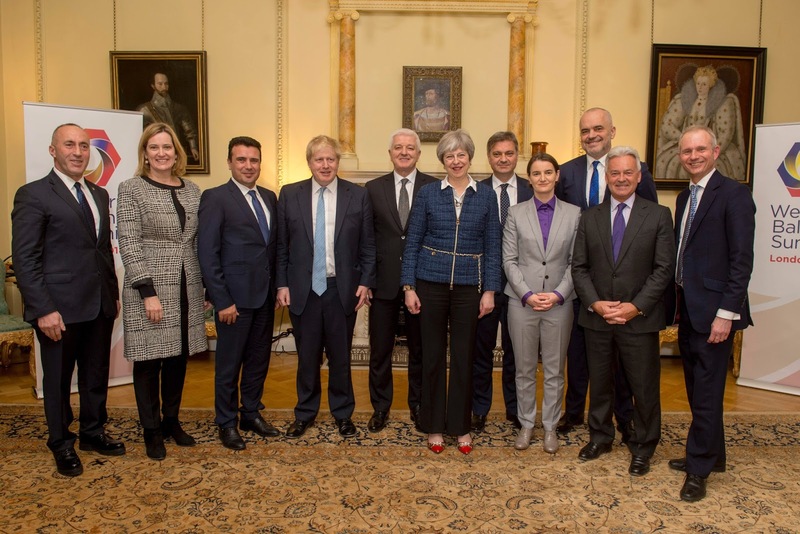 On Monday, Theresa May welcomed Western Balkans Heads of Government to Number 10 for a reception. It was bitterly cold in London, and the PM kept warm in her navy chain belt tweed jacket from Herno, teaming it with black trousers and vintage kitten heels from Russell & Bromley. Arriving at Number 10 earlier in the day with Philip, may doubled up in her navy Herno coat! On Wednesday the PM attended the weekly Prime Minister's Questions in Parliament. 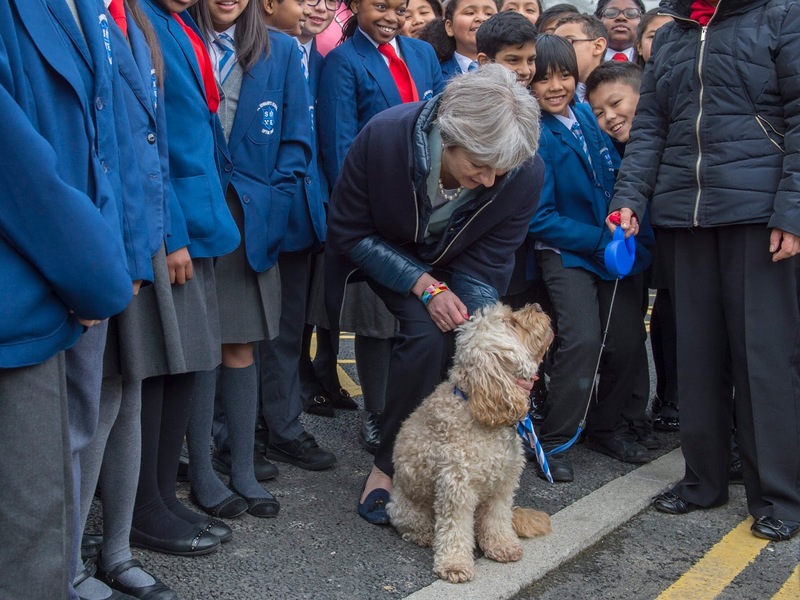 May wore a brown tweed fleck jacket with black trousers and the black patent sparkly brogues from Russell & Bromley. In the evening, Theresa May attended and addressed the Westminster Correspondents' Dinner delivering a hilarious speech. She wore a black off the shoulder dress with sheer sleeves, teaming it with cut-out black stilettos. 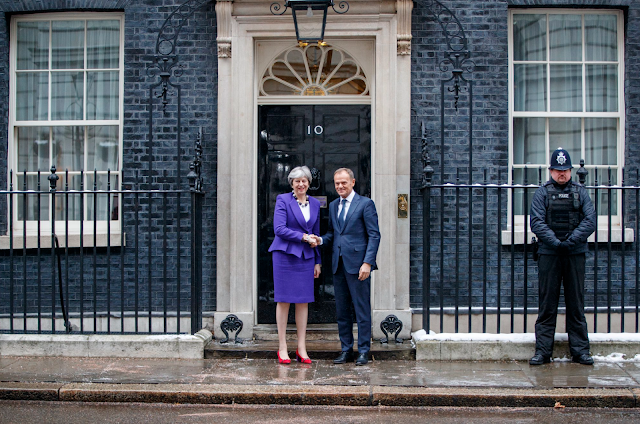 On Thursday, Theresa May welcomed Donald Tusk to Downing Street. She wore her fierce purple skirt and matching Origami jacket from Daniel Blake, teaming it with oversized black and white beads and the red Link In block heels from Russell & Bromley. Later in the day, the PM hosted a reception to mark St. David's Day. 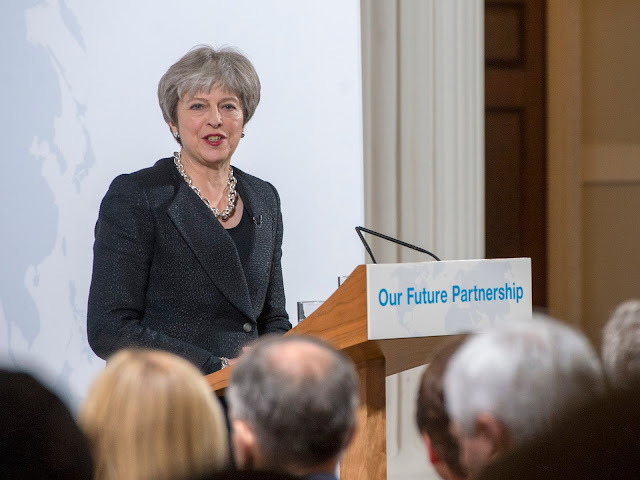 On Friday, the PM delivered her Road to Brexit speech at Mansion House. 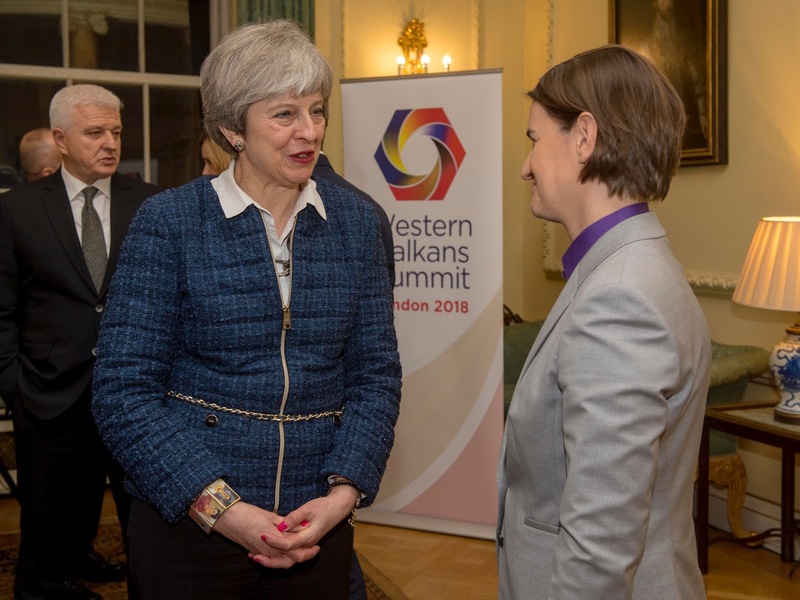 Wearing a tailored black Daniel Blake jacket, the PM accessorised with the Amanda Wakeley oversized chain necklace and bracelet and her Celtic Treasure ring. 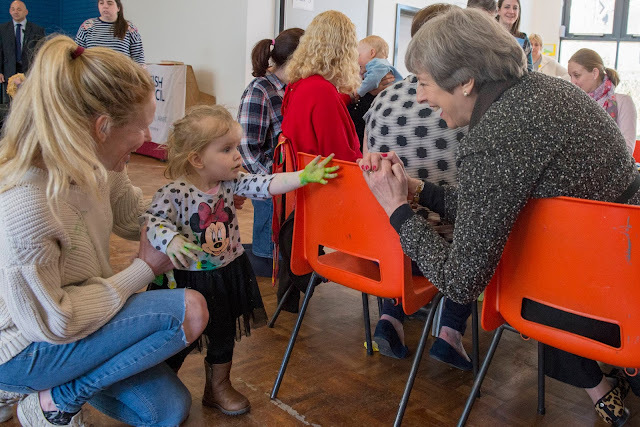 May also debuted a new pair of ankle boots from Russell & Bromley - the Socklet!